All-new and fully compliant with the HIPAA Final Rule and HITECH. A 2-disc set: Great HIPAA Training on DVD, plus superb HIPAA resources on CD. Two amazing products in a two-disk set: Basic HIPAA training for your staff and workforce on DVD; plus, an assortment of essential HIPAA Administrator resources on CD-ROM. Everything you need to train your workforce on HIPAA, delivered in a friendly, 52-minute audio-visual presentation everyone can relate to. The video-based training in this product is clear, compelling and delivered with a positive approach that helps people respect HIPAA - but not fear HIPAA. 1. 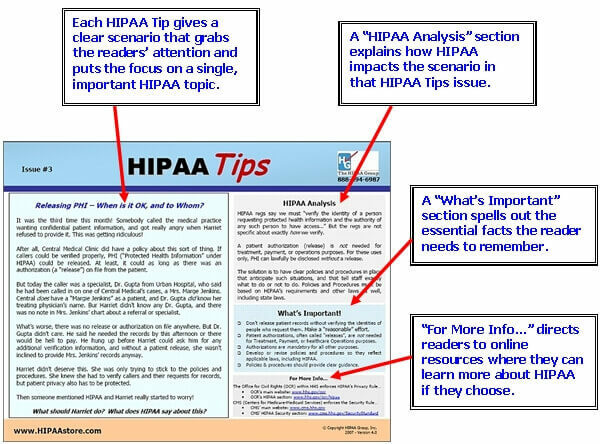 Understanding HIPAA -- the basics of what HIPAA is, what it does, and how it works. 2. Working with HIPAA -- teaches your workforce to work safely with HIPAA on the job. 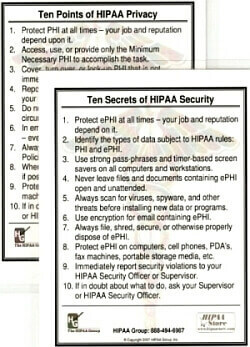 Printable HIPAA Training Course Agenda - print a copy for each learner taking the HIPAA training. Two Different Printable HIPAA Training Quizzes - test your learners' knowledge of HIPAA after training to ensure comprehension and retention with these 20-question quizzes. Training Quiz Answer Key - used to grade the HIPAA Training Quizzes. HIPAA Training "Certificate of Completion" Template - a beautiful, full-color training Certificate template you can use to reward each of your learners for their efforts. Two versions included: Microsoft Word “.doc” and “.docx”. HIPAA Training Log - track your HIPAA training and meet your HIPAA legal requirements with this easy-to-use HIPAA training log. Two versions included: Microsoft Word “.doc” and “.docx”. Summary of HITECH Changes to HIPAA - a concise summary of all the important changes to HIPAA enacted by the recent HITECH Act. Summary of HIPAA Final-Rule Changes to HIPAA - Twenty-five pages of essential data about the HIPAA "Omnibus" Final Rule and the changes it enacted to the HIPAA Regulations. Printable HIPAA Conduct Cards for Covered Entities - One of our most popular awareness tools, HIPAA Conduct Cards summarize HIPAA's most important points in plain language everyone can relate to. An excellent awareness tool - print one for every member of the workforce. This product is brought to you by the HIPAA Group, the original HIPAA experts. We’ve been inside HIPAA from the beginning, we have trained tens of thousands of healthcare professionals on HIPAA, and we have advised HIPAA entities of every size and type on HIPAA compliance. Our experts have testified in HIPAA legal cases, and our publications and training are considered the best in the business. Put our experience to work for you with this two-disk HIPAA Training DVD and CD set, and help minimize your chances of costly HIPAA violations.